President-elect Donald Trump has chosen Scott Pruitt, Oklahoma’s attorney general and a champion of the oil and gas industry, to run the the Environmental Protection Agency — the federal office that enforces nearly all laws that protect America’s air and water. Pruitt, among the nation’s most vehement critics of the EPA and Obama administration climate and environmental policies, has forcefully opposed federal mandates for power plant pollution controls and cutting carbon emissions to curb Americans’ impact on the climate. 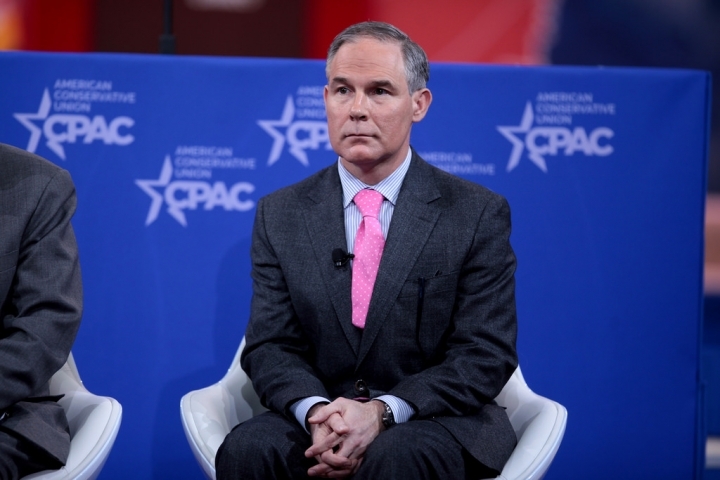 Okla. Attorney General Scott Pruitt spoke at the 2015 Conservative Political Action Conference in Maryland. To scientists — and most nations around the world — the science of climate change is clear, however: Human carbon dioxide emissions from burning fossil fuels are warming the climate at a rate unprecedented in human history, leading to extreme weather, rising seas, melting polar ice caps and innumerable other consequences. The Obama administration’s efforts to use the Clean Air Act to regulate carbon dioxide emissions is a cornerstone to its Climate Action Plan. The plan seeks to cut carbon dioxide and other greenhouse gas emissions in an effort to prevent global warming from exceeding 2°C (3.6°F) as required under the Paris Climate Agreement. 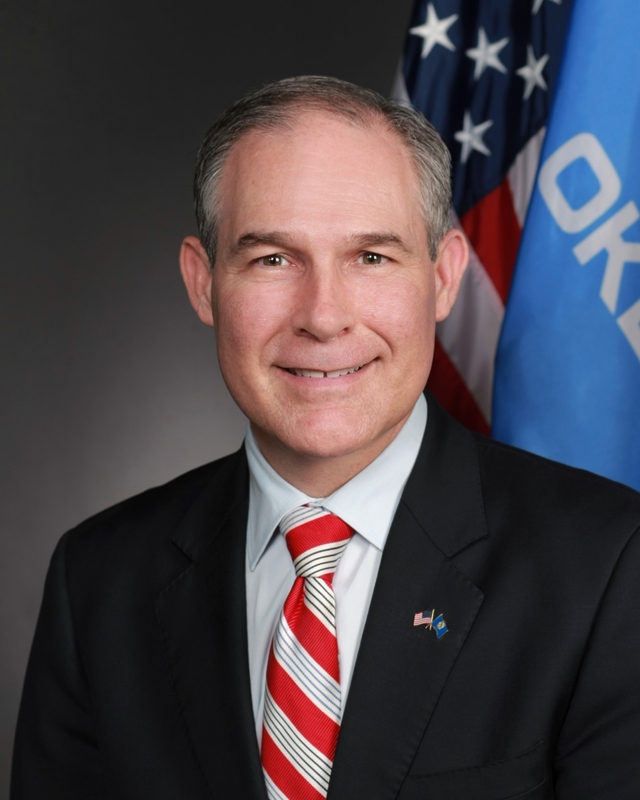 Shortly after the Clean Power Plan was finalized, Pruitt, as Oklahoma attorney general, joined 23 other states in suing the EPA to stop it from taking effect. Pruitt and Strange said the Clean Power Plan works by “executive fiat,” and said that it will shutter coal-fired power plants and increase the cost of energy. The New York Times reported in 2014 that fossil fuels industry lobbyists drafted letters for Pruitt to send to the EPA opposing its environmental regulations. The same year, Pruitt joined a group associated with the oil and gas company Continental Resources to oppose adding some of Oklahoma’s threatened wildlife to the federal endangered species list. Pruitt opposed the federal government’s efforts to reduce regional haze in southwestern Oklahoma by requiring the state to install pollution control equipment on coal-fired power plants. In doing so, Pruitt said the EPA “usurped the right of Oklahoma” to set its own energy policy. Scott Pruitt, Oklahoma's attorney general, has been chosen by President-elect Trump to lead the EPA. EPA climate regulation experts said Pruitt’s nomination signals Trump’s desire to roll back many U.S. climate policies. Stavins said it is less clear what Pruitt’s views and actions will be on the many other areas of EPA’s statutory responsibilities. Rhea Suh, president of the Natural Resources Defense Council, said in a statement that the mission of the EPA is to safeguard public health and protect America’s air, land and water.